The Hyundai Tucson is not a new name in India. We did get the first generation of the Tucson a little over a decade ago and slow sales prompted the Korean automaker to skip the second generation of this compact SUV. But the boom in the SUV segment in India is quite obvious and with the Creta doing really well even at almost Rs 16 lakh, there was definitely a market for a slightly more premium SUV. 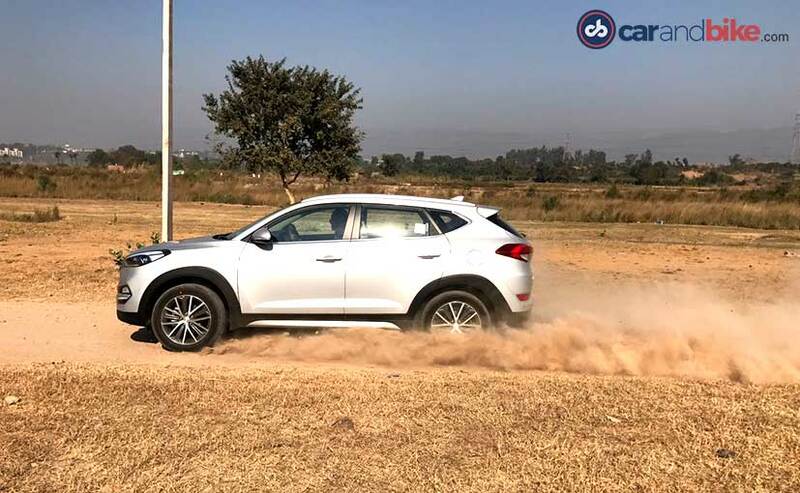 And this is why the new Tucson fits perfectly well in Hyundai’s SUV portfolio, right slap bang in the space between the Creta and the Santa Fe. The Tucson is designed to look like a baby Santa Fe. Look at it from the front and there are a whole bunch of design elements that jump out at you, starting with the large three slat grille with a chrome surround that interlinks the two headlamps. 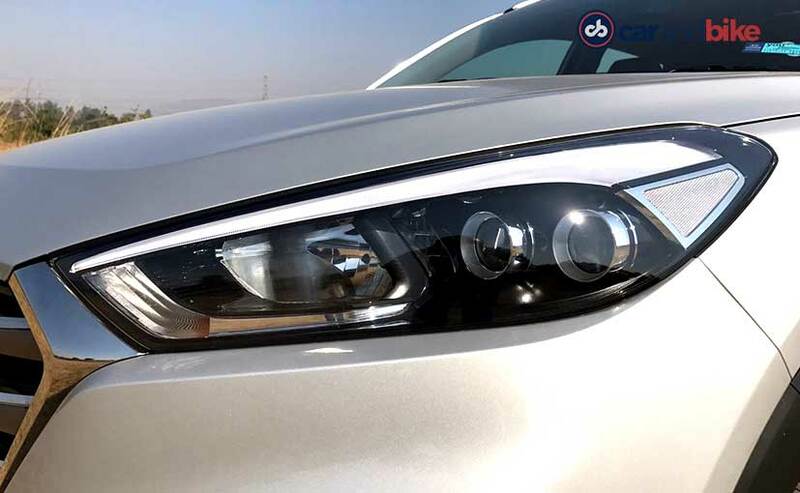 The swept back headlamps themselves are very detailed with a twin barrel LED cluster for the low beams and a halogen setup for the high beam. Then you have the long eyebrow like daytime running light in the headlamp and a secondary LED DRL just below the fog lamps. As a combination, you can spot the Tucson coming from a mile away. The front bumper, side skirt and rear bumper all get matte silver scuff plates which when combined with a darker colour like the dark grey or wine red looks great. The silver we have here masks it just a little. 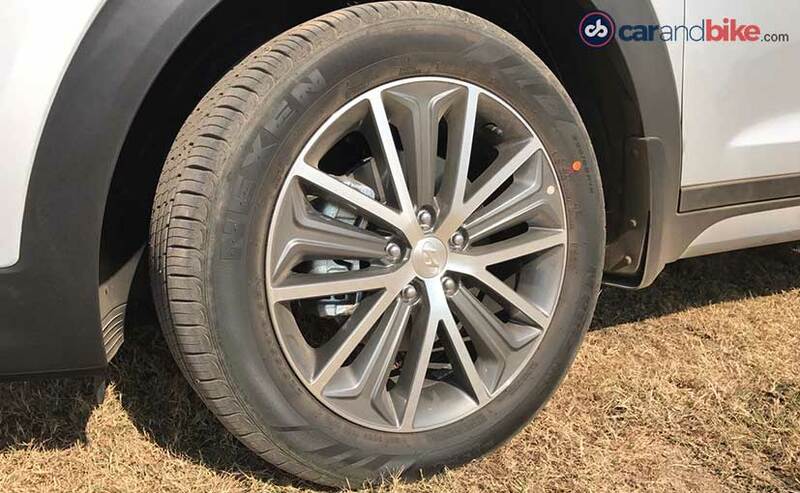 You also get a set of 18-inch diamond cut wheels that have proved to be very popular with buyers of the i20 and the Creta. Just like the front, the rear too has quite a few very distinct detail elements, for example, the twin trapezoidal exhaust tips that have been angled to match the bumper. The tail lamp too follows the same lighting pattern that you get in the headlamp with the slim long LED elements and the LED brake lights. Hyundai has really stepped up its game in the last few years when it comes to interior design and quality and the Tucson pretty much improves on the Creta’s design. The grey and beige two tone dashboard would have looked a lot more premium if it was offered in black but then, the current layout does look good with the polished silver AC vent surrounds and the gloss black AC control surround. The large central touchscreen is very easy to use and has a great user interface and as expected, comes with both Apple CarPlay and Android Auto making it second nature to use when synced to your smartphone. You also get parking sensors and a rea-rview camera along with features like cruise control. The Tucson is one of the first ‘mass market’ cars that offers an electronic handbrake instead of a conventional one. What this means is that the centre console gets a lot more storage area and two cup holders. 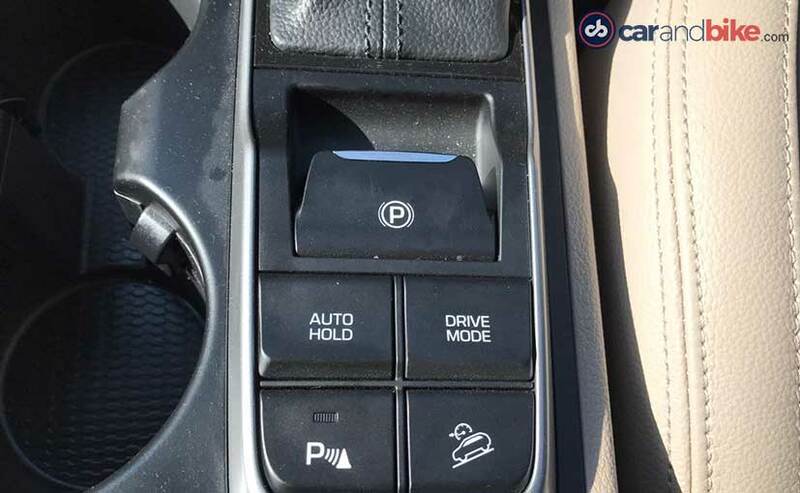 The Automatic variant also gets a drive mode button and hill hold assist buttons right next to the electronic handbrake. 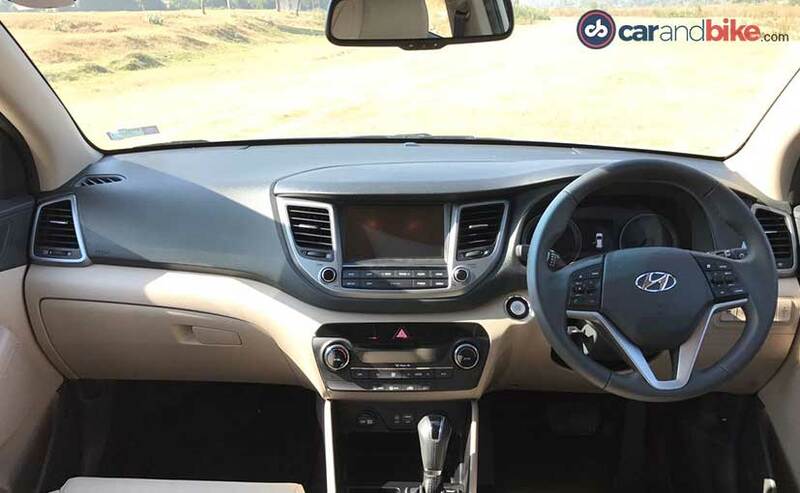 The Tucson also gets an electronic tailgate which can be opened and closed though a button on the dashboard which makes it very handy to use. 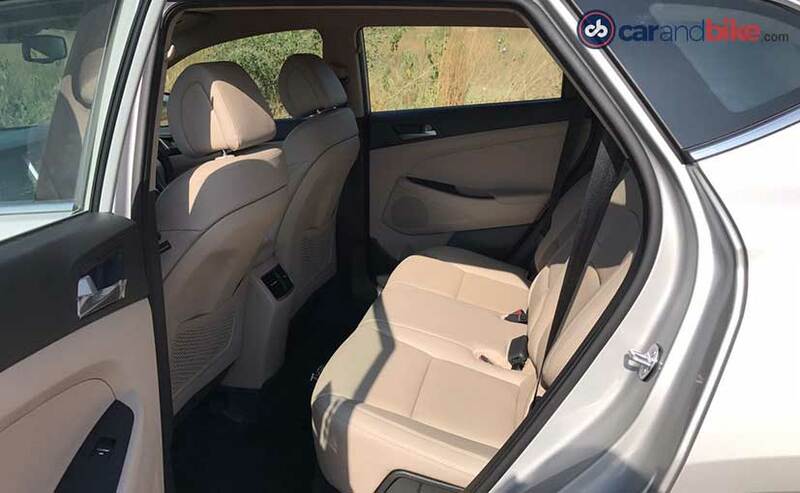 Get into the rear seats and the amount of space offered in such a relatively compact package will impress you. There is enough space for three passengers to sit comfortably and since the seats offer a 60:40 split, you can recline them to get more comfortable. The rear passengers get AC vents in the centre and the top of the line package gets leather seats. Safety features are something that we always appreciate and instead of providing a simple lap seatbelt for the middle passenger, Hyundai has gone that one step further and offered a retractable roof mounted seatbelt. The large boot has a retractable cover and Hyundai has offered the Tucson with a full sized spare wheel instead of a space saver. Considering the price point that the Hyundai Tucson is placed at, it had to have a diesel engine with an automatic gearbox. And that is exactly what it gets – a 2.0-litre 4-cylinder turbo diesel engine that makes 182PS of peak power and 400Nm of peak torque. 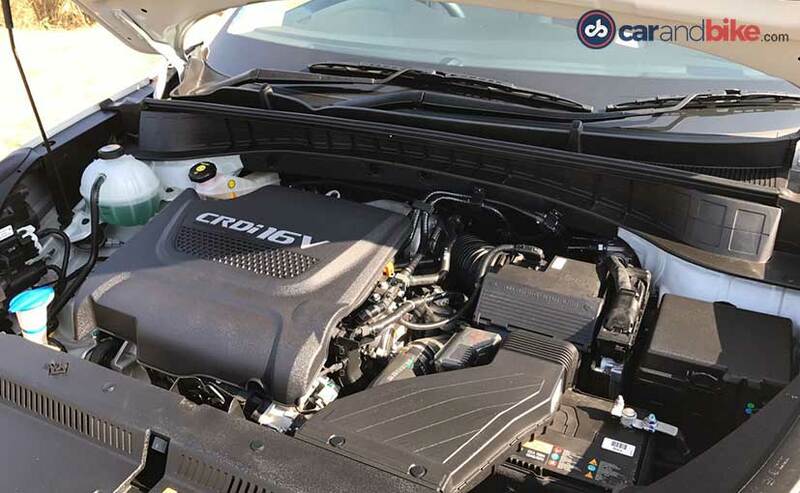 The engine is mated to a 6-speed automatic gearbox that gets a sports and eco mode as we mentioned earlier and is a proper torque convertor unit instead of the more popular AMT that is being adopted by everyone. With 182bhp, you would expect the Tucson to be quick in a straight line and it is. It wont win any drag races but is definitely quicker than almost every other SUV in its segment or even a segment above it. The gearbox too shifts smoothly and has no shift shock. A set of paddle shifters on the steering wheel would have been ideal. You could also choose to have a 6-speed manual with the diesel engine but honestly, in this segment, automatic is the way to go. The petrol engine is also a 2.0-litre unit with both a 6-speed manual and 6-speed automatic on offer. The engine makes 152bhp of peak power and 192Nm of peak torque and we will get you a detailed review of how it drives very soon. But what impresses us most is how much work Hyundai has done on the NVH levels. You can barely hear the diesel engine up to about 2700 rpm and even post that, the engine noise is not intrusive. 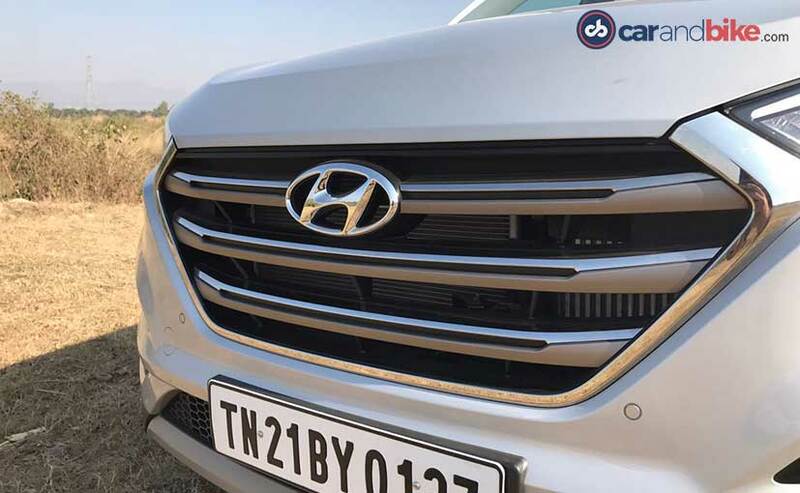 Hyundai has also worked on cabin noise in general and even the front fenders have received considerable foam padding to reduce infiltration of vibrations and noise into the cabin. All of this means that the Tucson does not wear you out as you drive it for longer distances. Gone are the days when Hyundai would make cars that would handle as well as a river barge. The new Tucson gets only front wheel drive in India but is still more poised than competition. That said, there is a bit of body roll when you push the car beyond its comfort zone and this gets compounded when you go through a set of tighter corners fast. The Tucson is one of those cars that can be made to handle but prefers to do it in a dignified and non-hooligan way. The trade off of course is great ride comfort. The Tucson doesn’t break your back over a pothole and is actually very comfortable over smooth and broken roads. There is a sense of cushiness in the ride but that doesn’t mean that the Tucson gets floaty as you get faster. In fact, this compact SUV feels quite poised and composed even at three digit speeds. Steering feedback is a little heavier than expected at lower speeds but does weigh up well. There is still a slightly numb feeling in the overall steering feedback but it is not as lifeless as in some of Hyundai’s other products. Brakes are a BIG improvement over the Creta and the Santa Fe and clearly customer feedback about the slightly numb brake pedal seems to have been heard and taken into consideration. The Tucson also gets ABS and EBD along with traction control as standard and two airbags as standard. The higher spec cars get 6 airbags (which in our opinion should have been offered on all variants). 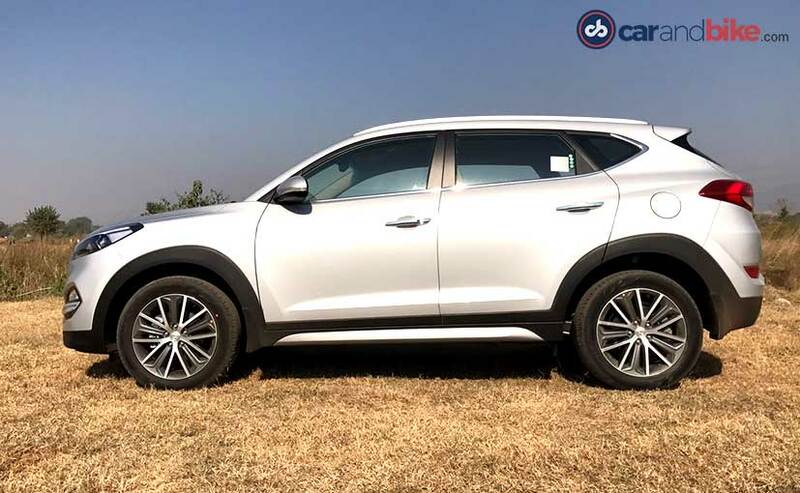 Priced at Rs 18.99-21.79 lakh for the petrol and Rs 21.59-25.99 lakh for the diesel, the Tucson is placed in a range with almost no real competition apart from the Honda CR-V and the SsangYong Rexton. 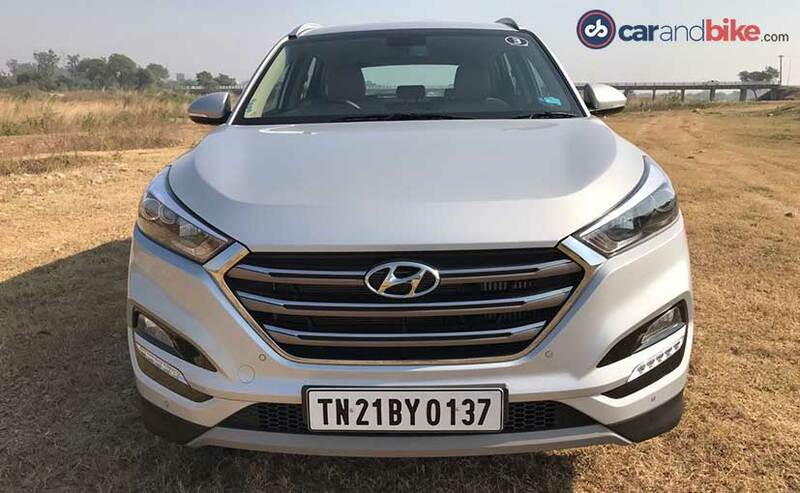 The Tucson, as we mentioned earlier also gaps the range between the Creta and the Santa Fe and will help Hyundai cement their position as a premium yet mass-market SUV maker. 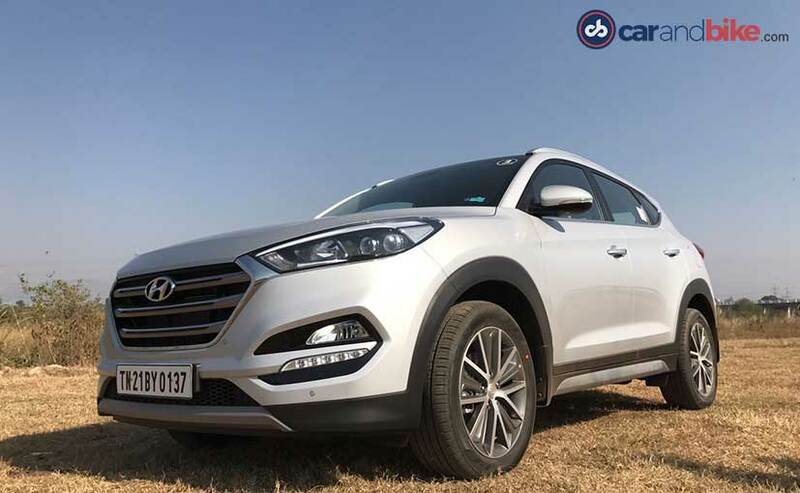 The Tucson will not be a large selling product, expect more than 50 percent of the buyers to choose the top of the line automatic diesel variant as we have seen in so many cases recently. The Tucson is a good blend of a comfortable and spacious and yet compact SUV that offers good driving dynamics and great interior tech. 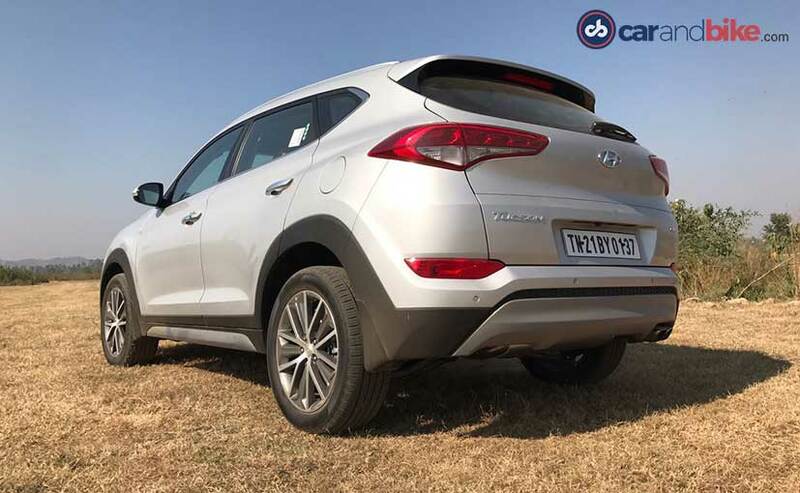 Design could be slightly polarising but the Tucson does have some great road presence and would certainly be a product we would recommend over the conventional Rs 20 lakh sedan.